Get Connected with Caz on Move-In Day! On August 21, 2015, Cazenovia College will welcome new students to campus as they move into residence halls for the first time. Move-In Day is an exciting day filled with new experiences. We encourage students and families to share their excitement during Move-In Day by tagging photos and posts with #CazUnpacks on social media platforms. View all incoming social media posts in real time on Tagboard (live social media feed). 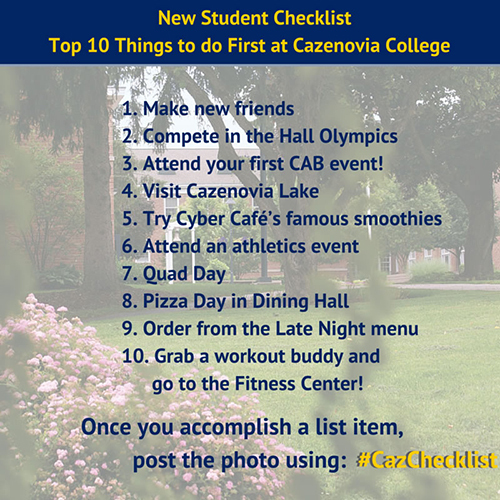 We created a new student checklist that includes the top 10 things students should do the first few weeks at Cazenovia College. Once you complete an item on the list, tag your photo using #CazChecklist and share on Instagram, Twitter or Facebook. We will repost our favorites.